We had arrived in Falmouth, at the western end of England’s Cornish peninsular, in mid-October, 2004, after a summer of cruising in Ireland, Scotland and the Baltic. The trip down the English Channel had been a beat against moderate southwesterly winds. But the winds had been strong enough to convince my youngest crew member, newly signed on in London, that ocean cruising was not for him and within hours of our arrival he booked a flight home. That left two of us, myself and Andrew, a lanky Aussie who had crewed previously, to continue to Portugal, Brazil and points south for the northern winter. We did try to recruit a local sailor for the leg to Portugal without success. Day after day the forecast for the approaches to the Channel was for strong to gale force southwest winds; very frustrating as we were eager to get south before the autumn gales set in permanently. After a week, it looked liked a window; northerly winds for a couple of days, the downside was an intense low in the Bay of Biscay which was tracking north. Ever the optimist, I thought if we headed into the Atlantic we might get to the west of low and pick up a tail wind for the leg south. We left in pleasant weather on a Monday with a northwest wind and set the sail to clear Lizard Point. Bent on the boom for the first time was a brand new storm mainsail and a Genoa jib was grooved in the roller furling gear on the headstay. By Monday evening the wind had backed and we were only making good southwest. Later we started the engine to motor-sail with a very light wind, the tidal current was pushing us towards Ouessant, an area to avoid, particularly with a storm coming. Once clear of the northwest tip of France the plan was to lay a course across the Bay of Biscay to Cape Finisterre and then sail down the coast of Portugal to Lisbon. The wind came back on Tuesday morning from the sou’sou’west and we had a great day under full sail, but the omens were not good; obviously we were well east of the low center. The forecast on the Navtex from the English station at Niton was gloomy, force 10 in meteorological area Plymouth, our location on Tuesday evening. As the sun was setting we reefed the main and discovered a problem with the new sail, supposedly copied exactly from my old faithful storm mainsail that had seen Fiona three times round Cape Horn. The aft reefing cringles had been installed a couple of feet too high and the boom was canted up at such an angle that it was impossible to reach it except near the mast. The wind had reached 30 kts by midnight and the pressure had started an alarming slide down, the central pressure of the low was reported to be 955 mb. On our barograph the pen fell below 965 mb, the lower limit of the instrument, and then stuck on the edge of the paper chart, something I had never seen before. At sunrise on Wednesday morning the wind had backed to southeast with a sustained speed over 40 kts and gusts to 55 kt. . We debated tying the second reef in the main but decided with the boom so high it would be difficult, if not downright dangerous, and we forereached under the single reef with the jib fully furled and the wheel lashed up. For the next day and a half we rode out the storm, holding our general position with a boat speed of 1 to 2 kts but losing ground due to leeway. It was a rough ride. 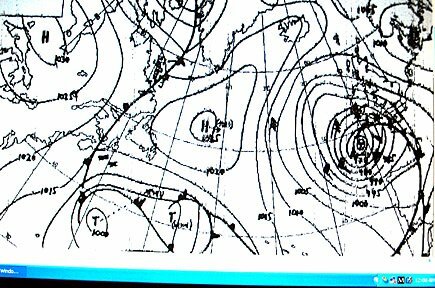 The faxes we received from the Offenbach station in Germany were ominous; the low was expected to stall on the southwest coast of Ireland and then possibly drift southeast. If this turn of events turned out to be true the storm was drawing a bead straight for us. Early Thursday I switched the Navtex to the French station on the west coast of Brittany at Corsen, their forecast confirmed that the low would move south, right for the boat, which seemed unbelievable if not downright unfair. Lows always moved to the northeast in that part of the world, right? When it was light we set the spitfire jib on the forestay; a very tough sail of only 40 square feet. This was an attempt to get the boat moving again and sail as far west as possible to keep the approaching low center to the east, but in this we were frustrated as the wind veered to the west so instead we tracked slowly south. It was a little encouraging to learn from the Navtex that the low was filling; central pressure had risen to 963 mb, at position 50ºN, 11ºW by early Thursday. The seas had built up by this time and Fiona was pounded by heavy waves that produced jarring crashes if they happened to be breaking when we slammed into them. Water forced its way through every crack, particularly the main hatch slides. The dampness below was not helped by the water that streamed off our foul weather gear every time we dropped through the hatch into the main cabin. On Tuesday night I had locked the vane of the self-steerer but foolishly not removed it from the clamp, finally the incessant wind vibrated the vane so much that the locking pin sheared off. Conditions began to improve a little just before sunrise on Friday, the wind dropped below 30 kts and veered. This gave us a chance to sail near the rhumbline for Cape Finisterre and put as much distance as possible between the boat and the storm center, now heading southeast. 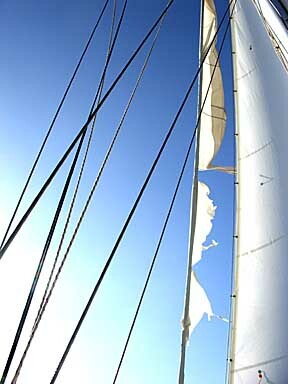 At lunchtime we unfurled a sliver of the jib and led the sheets inside the shrouds so that we could sail close-hauled. The little spitfire was still pulling gamely. The wind remained about 30 kts, with pouring rain, for a while the pressure dropped a few millibars then it slowly climbed. The boat was sailing well at about 5 kts and making good a course over the bottom that was only 15 to 20 degrees shy of the rhumbline. I began to feel that that the worse was over. Just as we were eating supper about 1930 hr a squall of over 40 kts hit the boat, but we were a little tardy getting on deck as there was nowhere to safely put down our plates in the violent motion we were experiencing. When we did climb through the hatch we saw the jib had torn above the clew from the leach horizontally for several feet. We furled the sail and in order to give some drive forward of the mast I decided to hand the spitfire and set the staysail. I had been hesitant to set the staysail before because short-handed in high winds the staysail boom can be a lethal club as the sail is being hoisted. We cast off the gaskets, hanked on the halyard and began to haul up the sail. After a few feet it jammed and would not go up or down. To keep the staysail boom under control during this phase we had rigged a vang with a four-part tackle, so at least the boom was not crashing about with the sail half up. In the fitful glow from the spreader lights and our flashlights we discovered the halyard had fouled the port spreader and seemed firmly stuck in the notch holding the shroud. Fortunately by standing on the forward end of the staysail boom Andrew was just able to reach the halyard snap shackle, no mean feat on the pitching bow in the dark. He attached a short line to the halyard and then unshackled it. By leading the halyard aft I was able to free it with a few vigorous shakes and we then hoisted the staysail, taking care to keep the halyard taut. 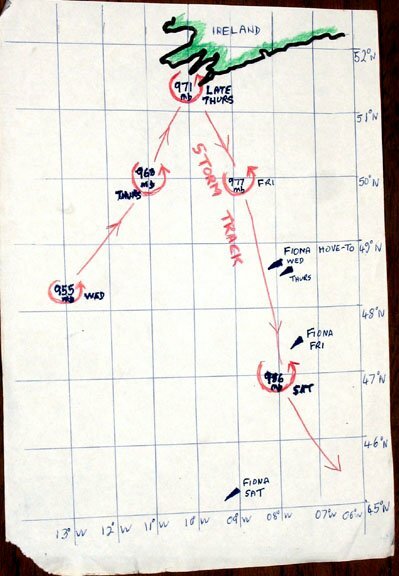 A glance at the diagram showing the track of the storm and Fiona’s position makes it clear the storm center must have passed us that night heading sou’sou’east and a few miles to the west, although we did not realize this at the time. As the storm headed to the east our wind veered to the nor’nor ‘west and we were able to make good the rhumbline course of 220º magnetic and even ease the sheets. It was still blowing 35 to 40 kts as dawn on Saturday revealed a dramatic seascape of long foaming waves with spindrift and low, grey clouds scudding across the sky. 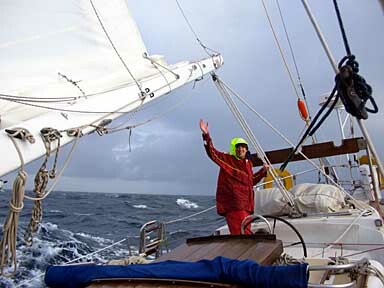 Fiona galloped for Cape Finisterre like a racehorse, but the weather was still atrocious, despite the freeing of the wind. The Meteo-France forecast predicted winds to force 9 with very rough seas, conditions we experienced in spades. After lunch-time on Saturday severe squalls forced us to disconnect the Aries self-steerer and hand steer in 30 minute shifts. With only one reef the Aries was overpowered by the weather helm. Stinging spray swept across the cockpit. More disturbing was the sight of the furled jib. The Dacron above the tear had not fully rolled up when we furled the sail and now the strong wind worried and tugged at the piece of cloth so that slowly the tear lengthened and the upper part of the sail began to unwrap. As I contemplated this gloomy scene a sleek jet roared out of the overcast at little more than masthead height. It was a French maritime reconnaissance aircraft. I shouted below to Andrew to give them a call on VHF, he assured them in his broad Aussie twang that we were OK and just to make sure they made two more passes. I wonder if they understood his accent? As they finally winged away I imagined the nice, dry cafeteria waiting for them with a cup of coffee somewhere in France when they touched down Then I wrenched myself back to the reality of a wet, storm-tossed boat with 150 miles to the Cape still to go. Perhaps those pilots in their hermetically sealed cocoon envied us, perhaps not. The storm careened on into central Spain with the low slowly filling to 1005 millibars. As it moved away the wind decreased to 25 kts and we had a great sail to Cape Finisterre We jibed over about noon on Sunday for the run down the Iberian coast and shook out the reef in the mainsail when the wind fell to 15 kts. Although the wind and sea conditions were quite manageable, the storm continued in an insidious way to inflict damage; the upper part of the jib continued to unwind and disintegrate into tatters. I made the unwise decision to get the jib off the headstay and set the Yankee. But when we unrolled just a few turns on Sunday afternoon the tear simply extended and left an even bigger area flapping in the breeze. We rolled it up again but the damage was done and the jib slowly flogged itself to pieces. We tried to restrain the flapping remnants by wrapping a line around using the spare halyard to raise it, but that did not work. Apart from the damage to the jib, which was deemed irreparable when we finally got it down in Lisbon, the boat suffered little long-lasting effects from its maiden voyage across the Bay of Biscay. But the storm’s evil eye, that spotted Fiona as it headed north and then came back to chase us certainly added to the Bay’s reputation as a heavy weather proving ground. Crew member Andrew, who is 6 ft 4 ins, stands beneath the reefed storm mainsail. The boom is canted due to an incorrectly located reef cringle. 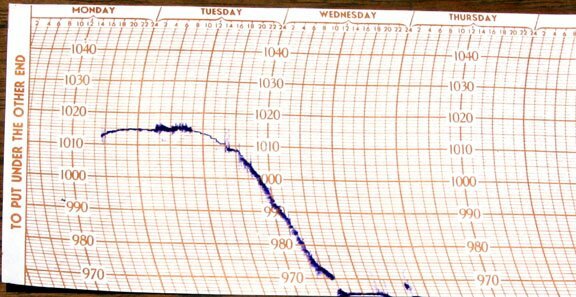 The barograph chart, Tuesday to Wednesday. When the instrument reached its lower limit of 965 millibar the pen jammed. A fax received from the German station at Hamburg showing the situation at noon on Wednesday. Diagram of the storm track, Wednesday to Saturday. The jib hangs in tatters off the headstay, shredded by the wind.